I really wish my friend would stop sending me links to the Daily Mail as I have to ask everyone to leave the room before I click on it. It’s a story about Derby County which is unlikely to be true just like every other article they’ve printed about Derby County in the last twenty years or so. I suppose that also applies to pretty much any article that they’ve printed about anything in the last twenty years. I’m on the bike again today, so I have to get shift on when I'm heading home as it’s an early start for Frank Turner 2000th tonight. L is at the gym, so I take the car, the boys and a home made cottage pie to her then she drops me off in town. I best explain about the cottage pie. This is for her parents and she’s heading straight there while I’m with Frank. She’ll pick me up again afterwards. 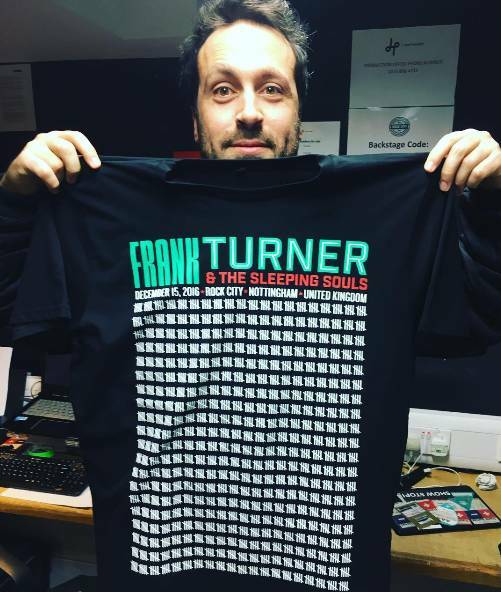 Clearly the numbers matter to Frank Turner. He knows exactly how many gigs he’s played and they’re all there listed in the ‘Live Archive’ section on his website going right back to 2004. If you’ve been to one of his gigs you’ll know he proudly announces what number the one you’re witnessing is and now the man himself, who admits that he’s forever on tour, has now reached his 2000th gig. Yes that works out at one practically every other day over those 12 years. Even better than that, he’s chosen my favourite UK venue as the place to hold this hallowed event because it’s also his favourite and of course it’s proudly independent as well, just like him. Despite it being a hometown gig for me getting tickets was clearly going to be hell and Frank launched a ballot as the fairest way to get tickets out there. He even put names on the tickets which he hoped would avoid the scourge of touting. Of course I never get anything in a ballot unless you count the beginners luck I exhibited in 2014 when I successfully bought Glastonbury tickets at my very first attempt with little fuss and without an entire network of computer equipment pointed at Seetickets. Lightning doesn’t strike twice though and I failed miserably in the massively oversubscribed ballot. That was until last week... when I got an email saying we have some extra tickets... want one? Erm... Yes please. So here I am, proving who I am to pick up my ticket on the door and rushing inside to catch The Tailors who have a stage time of 6:25! Next time Frank please pick a night when there isn’t a 10pm curfew. When I get in it’s already rammed. Folk have come from all over the world for this you know and unlike me they’ve come mega early. The Tailors are a country band who were apparently on one of FT’s biggest influences. They have been inactive for some time but have agreed to reform for one night only. Although someone clearly didn’t get the memo as they’ve had to find someone to stand in on guitar. Looks suspiciously like Frank. I catch the end of their set and what I hear sounds pretty good to me but the hot news is that this gig is no longer a one off for the Tailors. They will be back. Another big influence on FT and the man who apparently convinced him to start playing solo acoustic shows in the first place is his pal Jay a.k.a. Beans On Toast. Now I wouldn’t say I’m a huge fan of Mr Toast but he’s certainly an entertainer and his opening track intrigued me as it was all about 2016 (probably called ‘2016’). It documented the events of the year and he says he’s been playing it all year. So presumably it’s got longer and longer and longer. It seems to take up most of his set tonight and he seems a little hurt when he’s told his time’s up sooner than he thought because it’s time for the birthday boy. So only six days since he played Rock City on his UK tour proper, which I couldn’t get a ticket for, the man himself is back in Nottingham. The stage crew are decked out in great commemorative t-shirts that I believe have been provided by Rock City so aren’t generally available, which is a shame. So I suppose you want to know about the gig itself? Well, what’s to tell? It’s a Frank Turner show, so what do you expect? The man’s a legend and the show was brilliant. 2000 shows is a lot of quantity but feel the quality too. From the opening ‘Prufrock’ to the closing ‘Four Simple Words’ via an acoustic ‘Mittens’, a very appropriate ‘The Ballad of Me and My Friends’, an amazing ‘I Am Disappeared’ and many other highlights too numerous to mention. Although I ought to mention the serious disregard for Rock City’s 'No Crowdsurfing' rule during ‘If Ever I Stray’ where he wheeled out Beans On Toast and asked him to crowdsurf to the bar to get two shots of whiskey, then to head to sound desk where he had to high five the two guys there before sharing the shots with a random guy on the other side of the arena before heading back to the stage. He managed it before the song had finished but I’m sure he was supposed to go around one of the pillars and didn’t. They should have made him do it again. Overall, an astonishing brilliant night and here’s to the next 2000, which will be in 2028 I guess. Not that long to wait.